I, like Laura Sims, have mulled over the various ways in which the world could end on many nights. She says it “is just a roundabout way of worrying about death, I suppose, though it feels grander.” Sims expresses this in the afterword of her collection, Staying Alive, but by this point she has already convinced me that both survival and death are both quite grand, no matter the scale. With the first line of the collection (“By the bountiful lake of your torso the ships arrive”) I could not help but continue, excited to explore this already fresh metaphor for life. And it was fresh. Unlike classic poetry, each page was not a new poem but a part of a larger context. Titles often drip through the white space of a poem or collection, reminding the reader of the one common thread in each piece. Sims’s poetry in Staying Alive creates its own style. Divided into three parts, the contents of each page are limited in word count with large amounts of white space between the verses and words alike, while the formatting undergoes major shifts from page to page. I am often skeptical of non-traditional style, but in this case, it reflects the content in so many ways that I could not resist its surprising nature. In retrospect, a collection about post-apocalyptic Earth in standard quartets or haiku would probably feel even weirder. Yet these are not verses to describe how the world will end, but rather how we will survive, even if it is not in a form that is familiar. Sims ventures into poetry that strips away every human experience as we know it and replaces it with our most basic sensory skills and survival instincts. In this barren world, emotions still exist. The most striking aspect of this is that at the end of the collection, I am still not certain that the speaker is even human; the voice seems to project from some meandering bit of matter that was once part of a former society. This is my favorite aspect of Sims’s collection. The poetry is written in first person, often addressing a second person equally as much as the world around it. I say it because I am not certain this first person voice is even human. A page reads, “The world / Burns best / When its soft mass, intact / Is lashed, pinned or woven to deepening whiteness” This is unusual advice to suggest; it implies the speaker has experienced the world burning many times to deduce this. The specific language ties down this large image of the world burning to actions that one can do with their own hands, begging the greater question: who or what is responsible for what Sims suggests? They bade us be hard. Each item, person, emotion seems to have equal power and importance. The objects piled up seem to be commanding sadness and shame from the people, their former owners. Here, typical notions of the world’s end are deconstructed. By this point, a human may know how little the control, but this strips away emotional ownership. In the white space between these lines, any human connection to these words dissolves. The seemingly random form allows the reader to disconnect even further from manmade associations. Culture, carts of junk, waving goodbye – these are very specific human attributes, but there does seem to be some ethereal subtext, as if everything, as it has been known, is floating in unrecognizable pieces through this new world and all that is left is emotion. Had stood for a moment, a moment ago. Does astonishment become something useless? And where do these men go? It is fascinating, and a little bit absurd, to imagine this basic human experience transformed to…wet leather? These extreme opposites only illuminate the metaphor here. On one hand, emotions are interchangeable with physical material, and on the other, what humans recognize as physical can disappear, seemingly, into the air. With all of this, I never envisioned zombies, aliens, or ghosts haunting our wrongdoings. Sims prompts her readers to imagine that every part of us carries baggage; but at the same time, the world around us carries much of the same. One of the most redeeming qualities in poetry for me is the ability to magnify one particular moment, to represent one instance of existence as many other human experiences. The poetry in this collection does just that. Anyone can imagine astonishment transformed to a lesser expectation, to the past stuff as we remember it. Even set in an unfamiliar world, barren and dangerous, we can relate. A collection like this reminds me, as does the law of conservation of mass, that matter cannot be created nor destroyed. Everything from our happiness to our fingers will somehow be restored. 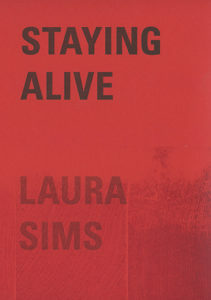 In an unlikely story of survival no matter our form or situations, Staying Alive is a poetry collection to fulfill hope in both an uninhabitable future and a seemingly unbearable present. Timothy Lindner is an MFA graduate from Fairleigh Dickinson University who currently works as the Planning & Resourcing Manager for John Wiley & Sons, Inc.